The story of X-Men #1 begins with twins separated at birth, one male, one female – both begin life as a strange form of intelligent, evolving bacteria. John Sublime has evolved from the bacterial stage to become the preliminary adversary of the story, but things aren’t always what they seem to be. He is following Jubilee who has with her a tiny traveling companion, a baby. We don’t find out much about the little guy in this issue beside the fact that it is of the utmost importance for Jubilee to get him safely back to The Jean Grey School and once there to give him a family. This task is close to Jubilee’s heart because she came to the X-Men in much the same way, with nowhere to go and no-one who wanted her. The sincerity she feels for this child’s safety and well-being comes across so well in Wood’s writing. 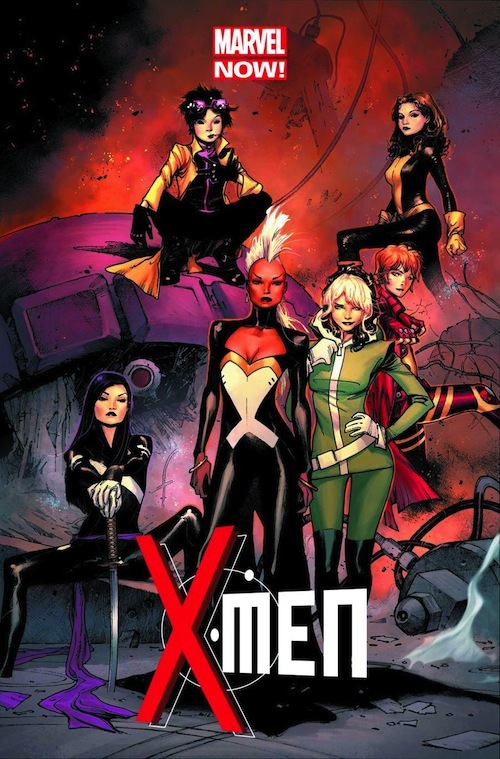 This is by far the most emotionally charged of the X-Books and I am not saying that because of the all-female team. I’m saying it because of Wood’s character driven story that focuses on interaction and dynamics rather than pointless action and contrived dialogue. The chase takes us from Bulgaria to Grand Central Station where Storm, Rogue and Kitty meet up with Jubilee on a moving train. It is Kitty who actually meets her as she phases through the roof of the train to find Jubilee and baby, however unbeknownst to her John Sublime has learned that she is headed to The Jean Grey School. Once the four X-Men are reunited on board, Jubilee begins to explain her current situation. It is at this point that we see the baby is no ordinary baby. He reaches out his tiny hand to touch one of the train’s P.A. speakers and some sort of electrical charge is passed from his finger into the train’s wiring system short circuiting many of the doors and killing the two drivers. The team flies into action to save the passengers. This scene is another example of how emotion trumps mindless punching. The action is suspenseful and smart, more of the edge-of-your-seat type than smash & crash, but no less exciting. While waiting for their team mates to return to the school, Rachael and Psylocke are about the business of interrogating John Sublime, who has surrendered himself to their custody. Sublime explains in some detail the danger of his sister’s return. He implores the team to help him, stressing the life/ death seriousness of the situation. The last two pages of the book are gripping and full of tension. Wood has constructed a rich, poignant sequence of events that leaves us wanting the next issue immediately. Brian Wood is a class act all the way around. He has taken the high road with this book from the costumes to the absence of any male X-Men to come in and save the day (it’s very clear they are not needed here). The gender of this team is not even thought of when you are reading this book – you are just swept up in a great story that is complex, entertaining and ultimately very satisfying. The characters are genuine and altruistic and they come across as very human. Wood has set this book apart from the other X-Books simply by virtue of its distinctive captivating tone. This is not to say that it is the only X-Book worth reading but it is very high on that list. Olivier Coipel has created a visual delight. His work on this book ranks as some of his best in my opinion, and I consider him one of the best artists working in comics today. He doesn’t waste time with garish pin-up poses of these heroines; instead he draws strong women who just happen to be beautiful. His realistic style brings the characters to life in a way that is sometimes lost in comic books. Laura Martin does a really excellent job of coloring Coipel’s work. Her colors add dimension and emotion providing each page with depth, combining for a visually stunning book. Overall I think Brian Wood has set the bar extremely high with this first issue. 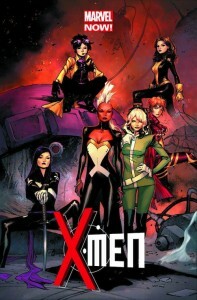 X-Men #1 is a dynamic story that is emotionally charged and suspenseful. Olivier Coipel delivers some of his best work to date concentrating on the plot and not the poses. I would suggest you not pass this one up. In a time when money is tight and comics are expensive this one is worth the $3.99.